We look forward to engaging with you at the 2019 Presidents and Provosts Summit in Washington, D.C. on Thursday, May 30, 2019 and at the Presidents and Provosts Summit Reception on Wednesday, May 29, 2019. 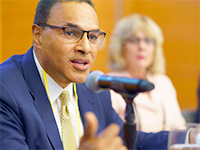 University and college presidents, rectors and chancellors, and chief academic officers from across the globe will join us during the NAFSA 2019 Annual Conference & Expo in Washington, D.C. for an excellent learning and networking event. This summit is designed specifically for campus leaders and chief academic officers who wish to cultivate deeper partnerships with each other while engaging on issues of global learning and campus internationalization. Attendees will gain insights from keynote speakers and breakout sessions designed for presidents and provosts respectively. A networking reception will be held the evening before the full day event. For questions about the summit, please refer to event information below. Wednesday, May 29, 2019 | 6:00 p.m.-7:30 p.m. The Chronicle of Higher Education, Washington, D.C.
Thursday, May 30, 2019 | 8:00 a.m.-3:00 p.m.
Marriott Marquis Hotel, Washington, D.C. Registration also includes full conference access (Expo Hall, Plenaries, NAFSA Pavilion, Sessions, and more Tuesday through Friday) and VIP seating at our Wednesday and Thursday plenaries. Register now for the Presidents and Provosts Summit. For questions, please contact PresidentsProvosts@nafsa.org. Please refer to our NAFSA 2019 Annual Conference & Expo Registration page for general payment, cancellation, and refund information. 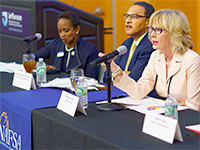 The Presidents and Provosts Summit event is reserved exclusively for those holding the role of president or chief academic officer at a higher education academic institution. Titling practice of these roles may vary based on country. For questions, please contact PresidentsProvosts@nafsa.org. Registration does not provide event access for additional staff members. Questions about event accessibility should be noted in the reservation form; more information can be found by reviewing our Annual Conference FAQs. Those not eligible to attend the Presidents and Provosts Summit are encouraged to register for the NAFSA Annual Conference & Expo and to consider other NAFSA Signature Programs such as the Symposium on Leadership or the Global Learning Lab. Registration for the Summit includes access to an exclusive hotel room block in the Marriott Marquis Washington, D.C. until March 22, 2019. Summit attendees seeking to take advantage of this offer can indicate their interest by registering now. After March 22, and for other hotel listings, please refer to the Housing and Travel section of our NAFSA 2019 Annual Conference & Expo webpages. Starting in March, please register for the Presidents and Provosts Summit first and then complete hotel reservations. *Please check in and pickup your NAFSA Presidents and Provosts Summit conference badge before attending any of the events above. NAFSA thanks Navitas for their generous support of the 2019 Presidents and Provosts Summit, and The Chronicle of Higher Education for their generous support of the Presidents and Provosts Summit Reception.